This post was written by a very dear friend of mine, Linda Salzman, in memory of her beloved granddaughter, who passed into the arms of Jesus on November 16, 2011. It is long, but it is from her heart, and I encourage every one of you to read it. 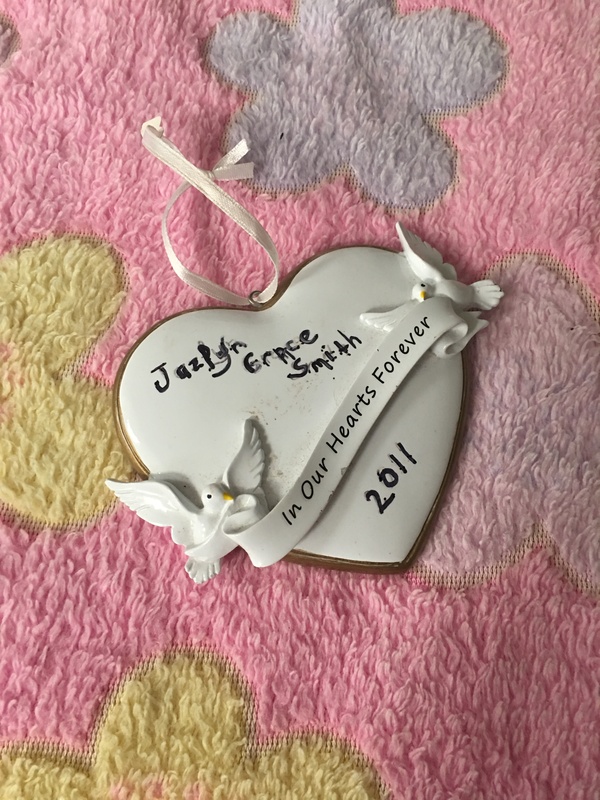 “In celebration of the life of Jazlyn Grace Smith. We only had her for 3 short months, but she forever changed us. You will both laugh and cry as you read these words, and it will be a bit lengthy. But it has to be to tell her story and ours. Our prayer is that through your tears and your smiles, you will be blessed and encouraged with how God walks us through those things we think we can never endure. Jazlyn Grace Smith…. Butterfly Girl… Jazzy Jazz… Our Princess with the crooked smile… Here we are marking the 5th anniversary of the day that will be forever etched in our hearts…. The day we had to say “See You Later” to our beautiful little baby girl. The morning came with no warning. No chance to say good bye. 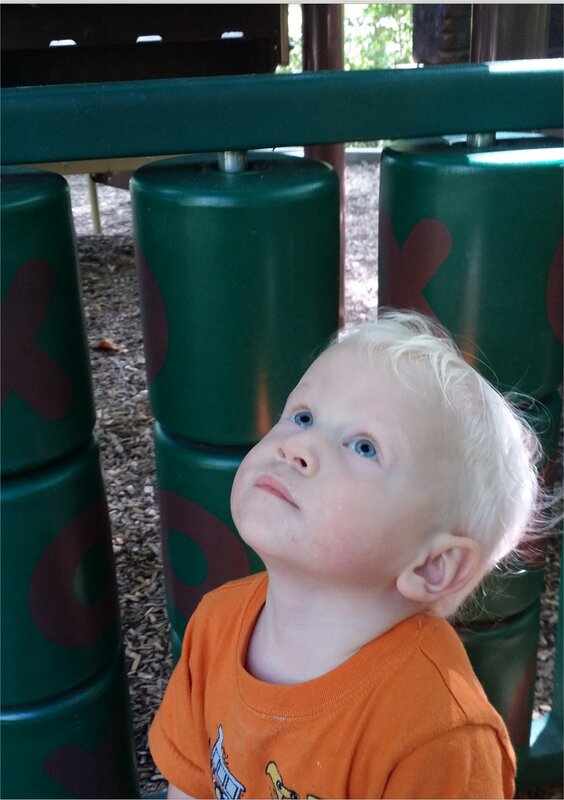 …and for her little brother Jayden who was too young to understand everything that was happening. For all your aunts and uncles and cousins and grandparents…for all the loving friends on both sides…life changed. Not only did it change, but it seemed to stop. Phones were ringing, and news that sent us into shock and disbelief were spoken. How could this be true? God would never allow such a thing to happen. It had to be a mistake and everything would be alright. But it was not a mistake. And nothing was alright. Being a Pastor somehow made it harder. Because I was being asked questions I had no answers for. Those questions were coming from our family, and that unexplainable place of grief. Not only did I have no answers, but my heart felt cold towards God. That day my mind shut off, and I couldn’t seem to get a straight thought on how to pack to leave for Florida to be with my daughter and her family. When I spoke to my daughter Stephanie on her way to the hospital in the ambulance and heard the shock and pain in her voice, and heard the wail of the sirens over her tears, it broke my heart in two… I couldn’t fix this. Her sister Jennifer called me, and I could not understand her words through her sobs. My husband and I were in total shock and disbelief. I vaguely remember being on my knees and screaming and pounding the floor. My son Shaun and his wife Kaitlin were trying to comfort me, while in shock themselves. 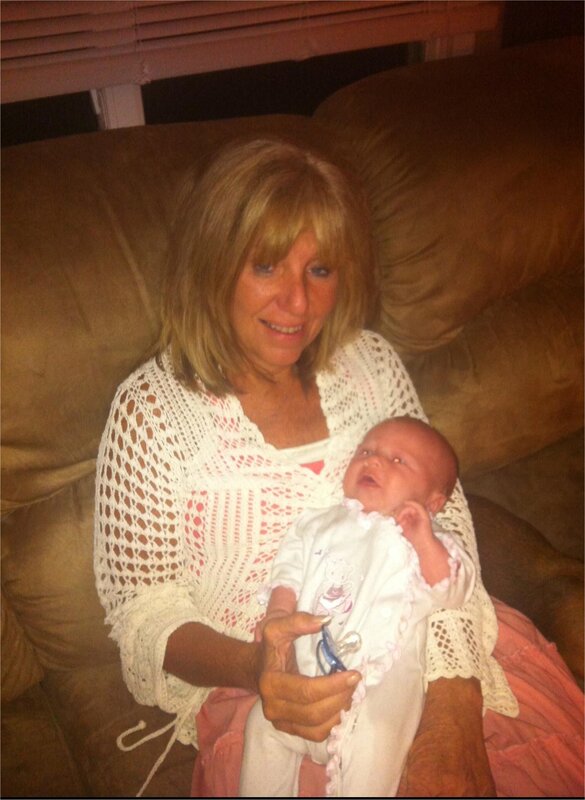 Jazlyn’s grandmother Penny had called, and her voice sounded hollow with grief. Jazlyn’s grandfather Dave and her Aunts Kelly and Krysta and their husbands were all in the same place we were. Our other grandchildren as well were in total shock and disbelief. How do you digest the news that this beautiful 3 month old sweet baby girl; the one we had all the plans of making such memories with; of watching grow up; was gone? SIDS comes suddenly and without warning. The days following that phone call are still a blur at times. The trip to Florida and all the phone calls in between took forever. My husband and I flew down there on the first plane we could catch, and my son Shaun and his wife drove. Stephanie called to say that police cars were lining her street when the family got home from the hospital. They had to separate them and ask their questions. And I was told the detectives were so kind to them. Protocol had to be observed to make certain the cause of death. That was the longest trip of my life. It seemed to take days. I was so thankful for her family that could be there with her and Michael from the beginning. Walking in the door was both a relief and heartbreaking. But as Stephanie ran towards me, and I grabbed her, and we sobbed together, and her husband Michael came and put his arms around us, I saw the grief and the pain in their eyes…I felt so helpless and so broken. All I could seem to pray was, “God help us get through this.” But my prayers felt empty to me. At one point, I felt compelled to go into Jazzy’s room and sit on her floor. I walked in and shut her door behind me and just sat there. I smelled her sweet baby smell in that room. I looked at her bassinet and saw her stuffed animals and toys. I picked up her pink blanket that Stephanie let me keep, and I buried my face in it and I sobbed. Those kind of tears go beyond any I had ever cried before. 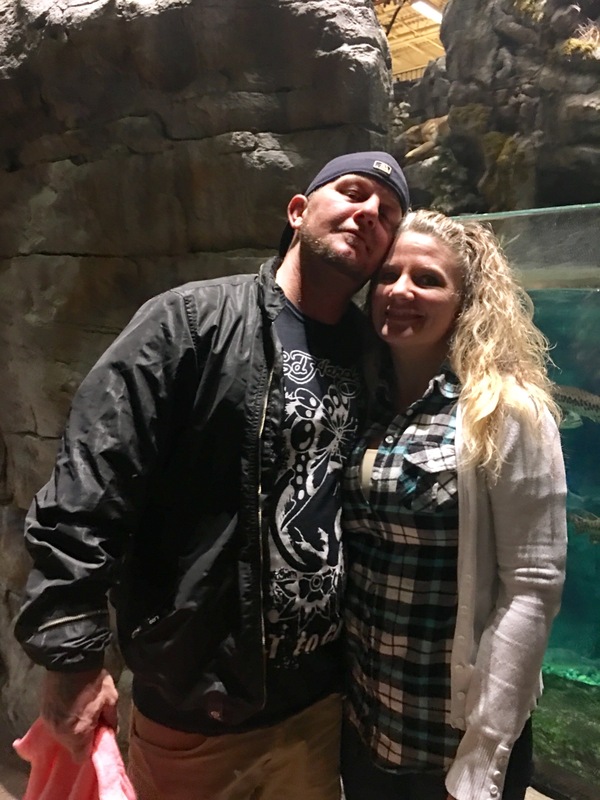 I wanted to be strong for my daughter and her husband, but at that moment, sitting on Jazzy’s floor, with my face buried in her blanket, that is when it became real to me. The shock was wearing off. It was as if I had been given a sedative that was now wearing off, and in the place of shock and disbelief, came the deepest grief I have ever felt. I couldn’t move. I couldn’t pray. All I could do was sob from the deepest part of my being. Part of my mind was trying to say “get up and go back out with everyone before you’re missed,” but I could not move. I’m not sure how long I sat there. I do remember walking into the kitchen and trying to hide, and all of a sudden, Stephanie and Michael were in there with me, holding me and we all cried together. I truly thought my heart would break into a thousand pieces. The days following were almost more challenging. When we had left to join the family for Florida, I thought I would be the speaker at her service. They did not have a church home in Florida yet, even though they had been looking for a while. God’s grace came in the form of the amazing people and leaders from Freedom Destiny Church. My daughter’s ultrasound tech was a member there, and when she heard the news, she rallied her church family. And they began to come around us all with such love! Food was brought every day for the next two weeks or more. They called, and they visited. These strangers to our family became family, and they still are today. The next few weeks were filled with calling the medical examiner’s office many times as they would not release her body until the autopsy was completed. Finally, one day I called them and for lack of better words, I had a breakdown session on the phone. We were unable to plan her service, or even see her, until they released her. And I told their office they were keeping us in a type of excruciating limbo. The next day she was released by the medical examiner, and we were finally able to go to the funeral home. That was so very hard, and as we walked through the front door, an assistant greeted us and we asked to see Jazlyn. He was very kind and pointed to our left, and there she was in a tiny casket. Stephanie ran to the casket and buried her face into Jazlyn’s and sobbed over and over…”My baby…my baby…!” She looked like so beautiful, and it seemed she was just sleeping. Michael was wonderful and tried to comfort Stephanie, but there was no way he could. He was so grieving himself, and I could see the look of helplessness on his face. Jayden didn’t understand. He kept calling her name, and wanting to kiss her. We all stood there around her casket. It was like experiencing those first hours all over again. The only thing was, there was no shock now. We knew it was real. As we left to go home, we all felt like we were somehow leaving her there. Alone. Stephanie and Michael made the decision to have family pictures taken with her. Some people may not understand that, and it was hard to do, but now that we have those photos, we would not trade doing them for anything. Those are precious pictures, and they always will be. Those next days were filled with how to possibly plan her service. Freedom Destiny Church so surrounded our entire family and helped us navigate through the difficult planning and details that had to be made. Stephanie had wanted to get something very nice and special to wear to her daughter’s funeral, which meant she had to go to the mall and pick something out. As we walked towards the doors of the mall entrance she said to me, “I’m going to pass out. I can’t do this.” And I had to be firm with her and force her to keep going. I knew on the day of Jazlyn’s service, it would be so important for her to look beautiful, and so we pushed ahead. Her sister wanted me to take Stephanie home, but I knew in my heart how important this was. The first store we stopped in had exactly what she needed, and I know that was God. As we were all in the dressing room helping her, she broke down and cried and the sounds that came out of her could be heard by everyone in the dressing room area. But we got through it, and finally left the mall. The day of Jazlyn’s service came, and her parents dressed up and looked so wonderful; it may sound strange, but that somehow brought them a sense of comfort. Her cousin Bri and her Uncle Robert and Aunt Jen had put together a beautiful video tribute to her. It was so very sweet and made us cry, but it also made us smile. Memories were spoken and shared. Her Grandmother Penny wrote a special poem, and I shared some things that were on my heart. The funeral home director said he had never seen such a sweet service for a baby that was so well done in all his years there. Freedom Destiny Church did a beautiful reception afterwards for her, and they were there at her service to speak and to love on all of us. What a tremendous blessing and comfort that was. As the service concluded and we walked outside into the sunshine, the sight of the pall bearers carrying that tiny white casket to the graveside was so surreal. It felt like watching a movie that wasn’t really happening. A few nights later we all went to the cemetery. It was Thanksgiving night, and after we ate dinner, or shall we say went through the motions of eating, we all knew we had to go to the cemetery. Our family knows that only her body was put in that grave, and she is with Jesus, but we were compelled to go. It brought us a sense of somehow being close to her. As the family gathered around her grave, I decided to take the smaller children over on the sidewalk to try and keep them a little occupied. And all of a sudden I looked up and saw the family gathered around the tiny grave with the lights from our cars shining on that gravesite. And as the car lights lit up the area where they were standing and shined on the spot she was buried, it was such a feeling of “this just can’t be true!” that flooded my heart. Jayden looked straight up into the night sky that was filled with beautiful stars and pointed his finger towards Heaven. The look on his face was a look you have when you see someone you know, and I believe God let him see her. 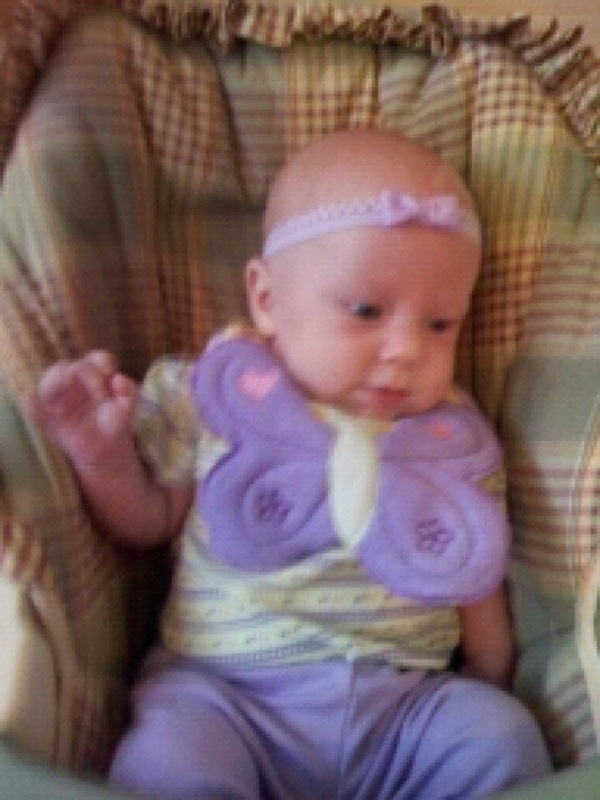 That Sunday we went to church for the very first time since Jazlyn died, and I didn’t want to be there. I was struggling so much with my faith. I felt cold inside, and I told God I didn’t want to be there. My emotions scared me. The Holy Spirit spoke to my heart and he said, “Linda, when praise becomes a sacrifice.” All of a sudden, I felt as though my body was turned to face to my left, and as that happened, I looked and saw my daughter Stephanie and my son in law Michael, holding hands, and their other hands were lifted straight up to God, and with tears streaming down their faces, they were praising Him. I tapped Stephanie on the shoulder, and when she looked at me, it was a look filled with such pain and agony. And yet I saw a peace on her face. I told her I wanted to be like her when I grew up. The following days found us all on autopilot and stumbling to find our way. And yet, we prayed and we held onto God as best as we could. When we had to leave to return home, it was so very hard. Saying good bye to Stephanie and Michael and the kids, and her sister Jennifer and her family, was emotionally almost impossible. Shaun and Kaitlin had had to leave before us to return to work, and that was so difficult for them as well. Our family was drained in every way possible. We were broken. I would like to say that we were so filled with faith, but that would not be the truth. It shook us to our very core. It was at our lowest point, after Jazzy’s funeral, and when things quiet down and the world keeps going on, and you have to go through the motions of life once again, that some amazing things began to happen. We had just launched Lions Heart Ministries three days before Jazzy died, Stephanie and Jennifer came that day to surprise me. Little did we know how soon life would change. That first Lions Heart meeting we had after returning home was bittersweet. As I shared our story, which was becoming a testimony without my knowing it, many were being encouraged and blessed by hearing how God had kept us, and how He was healing our hearts in the midst of such pain. They were relating it in their own lives, and some that had lost children of their own were getting healed by hearing our story. They were relating in different ways to feelings of helplessness in the face of agonizing trials, and they were being released from the guilt of having felt like their faith was but a shred, and of being angry at God and not understanding “why?” We had so many people share with us about extreme things they had walked through, and how they, too, had struggled with their faith. They shared with us that they felt safe with us. And God was beginning the healing process in us. About a month after we returned home, God gave me a vision of her. She was older, and she had flowing long blonde hair like her mother’s. 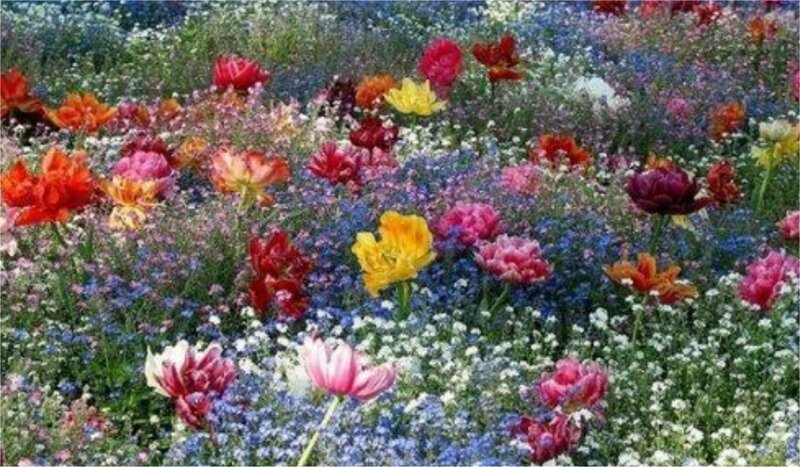 She was running through a field of flowers, and her face was radiant. A few days later, I told Stephanie about the vision, and she had been given the exact same one! [And I had it, too.] Then I read a post Shaun had written on Facebook about her, and it described the vision. My grandson Jayden would just start laughing for no reason as though he were seeing someone. My daughter Jennifer was having butterflies visit on a daily basis. Stephanie and Michael told a story about a nurse in the ER that had taken Stephanie by the hand and led her over to the bed as they were working on Jazlyn; and put their two hands together. Michael said he remembered walking over to the bed, but there was no nurse there. We know it was an Angel. Butterflies would land on us and not move. That may not sound like such a big deal to some, but we knew it was God comforting us. And more and more people were sharing how our story was such an encouragement to them to keep on going, no matter what they were going through. Was it easy? No. The days were filled with memories, and tears still flowed for no reason at all, and very often. Stephanie and Michael struggled so much with thoughts of… “What could I have done different that night…?” The truth is – nothing. There is nothing anyone could have done different. Losing our precious Jazlyn caused us to begin to press into God. You see, we know that one day we will spend eternity with our Butterfly Girl. And we began more and more to share her story and the message of salvation. Stephanie and Michael were blessed in the next few years with two more children. Jayce, who is such a sweet boy of almost four years old. And Journee Grace who has her big sister’s middle name. She is 19 months old and quite a little character. Jazlyn has two more cousins added to the family now, Adelyn and Noah. Precious little ones and all her cousins are growing up so fast! It is our hearts’ desire to start a SIDS foundation and help other families who will walk this way, not only as a result of SIDS, but in any area. Yes, life has gone on. It must. But we were forever changed by our beautiful blue eyed Princess. We can laugh now with memories of her, but we still cry as well. We wonder what she would have been like. There will always be an ache in our hearts and a missing piece. But we will testify to the goodness of God! Because we would not have traded one moment of those 3 months we had with her for anything in the world! She is playing at the feet of Jesus and waiting for us to one day join her. Our family would like to thank all our friends who have walked with us on this journey! To thank you for your prayers and your love! To thank you for knowing you did not have to say a word, but just love us. Thank you Jaelyn Steverson for the Angel you are, and the love you have shown keeping her graveside watched over and full of flowers! Thank you to all our extended family and to Freedom Destiny Church! You were all love in action! And thank you to Jesus! Our Heavenly Father. In the times we could never understand, You carried us in Your arms. You knew where we were and what we were going through. You showed us so many signs along the road of Your never- ending love! Thank you Jesus that we are guaranteed to spend eternity together! And I want to say “Thank You” to our family. We are not perfect, not even close, but I love all of you with all my heart. Stephanie and Michael, I know Jazlyn is proud that you are her parents. God picked you both just for her. He gave you a special treasure, and you watched over her well! 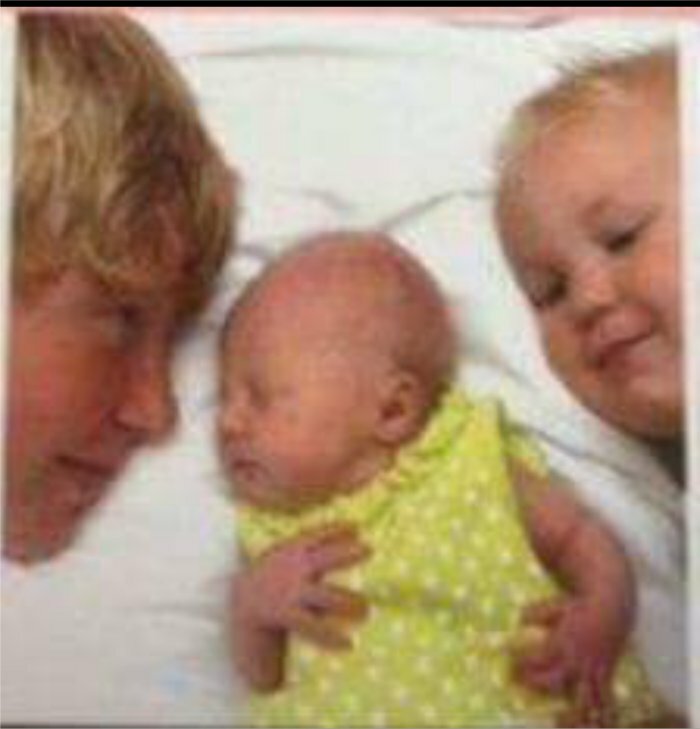 Josh, you are the oldest, and memories are hard, but you were a great big brother! There is so much more to her story, but that will be written later. We pray our story has encouraged you to keep walking through whatever storms that may come your way. Knowing that is not the end of your story, just like it isn’t the end of hers. For truly, we are here but for a short time; we are just passing through. Heaven is our home but we are here to make a difference. 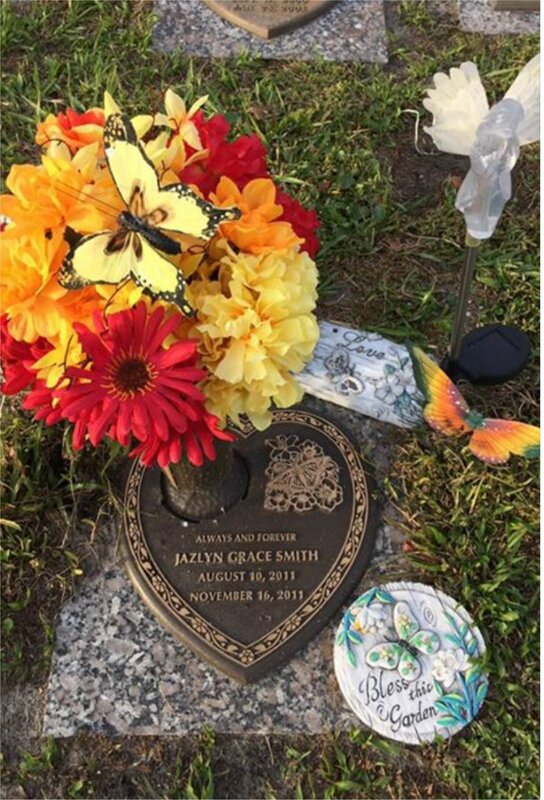 Thank you Jazlyn Grace Smith for making a difference in all our lives. Blessings and prayers to this entire family! I love you all so much! Previous If I’d Only Known. Next God, Where Were You?